Have you been searching for a Used Car or Previously owned vehicle? There is no better time than the present to check out Mruk Auto Sales. Located at 4821 Camp Road Hamburg, NY 14075. We pride ourselves on dealing with our customers in a honest & straight forward manner. We are a no pressure dealership. Why should you choose Mruk Auto Sales? 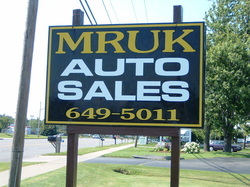 ​At Mruk Auto Sales we treat our customers the way we want to be treated. Moreover, we work hard at maintaining the highest customer satisfaction. If you have any questions, in regards to Used Cars or Previously owned vehicles, let us know, and we will be glad to answer them. We understand there are a number of options regarding Used Vehicles in the WNY area, which is why we try our best to provide you the best vehicle for the best price. At Mruk Auto Sales we want our customers to feel comfortable choosing us as their source for Used Cars, Trucks, SUV's & Vans. At Mruk Auto Sales you deal directly with the Owners. Jim and Jen Kieliszek will work with you personally in your purchase of a previously owned Car, Truck, SUV, or Van. We have been located at 4821 Camp Road in Hamburg, NY 14075 since 1979. At Mruk Auto Sales our main goal is customer satisfaction. Our satisfied customers often recommend us to their Friends & Family. We value our large repeat customer base. We do everything possible to make your purchase as easy as possible. We strive for 100% customer satisfaction. -We accept CASH, BANK & CREDIT UNION CHECKS as forms of payment. -SELLING QUALITY USED VEHICLES FOR 40 YEARS!!! -PLEASE CALL & MAKE AN APPOINTMENT BEFORE COMING OUT. WE ARE SPENDING TIME AWAY FROM THE OFFICE TRYING TO FIND QUALITY VEHICLES.